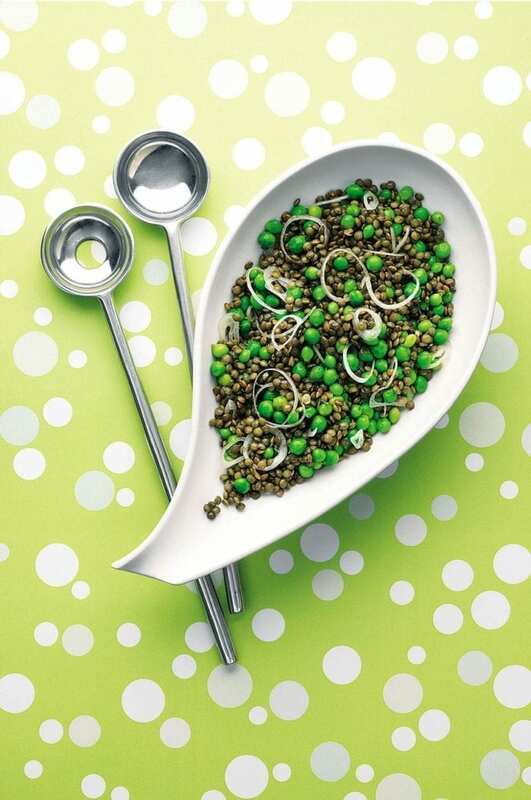 This pea and lentil salad is a light, fresh and quick vegan recipe that will appeal to all. There is no need to soak Puy lentils. Just wash them and cook in plenty of unsalted water with the garlic for about 20 minutes, until they are tender but with some bite. Discard the garlic at this point if you wish. Drain and place in an outsized serving bowl. Add the shallot, lemon or lime juice and oil to the lentils and toss together. Season to taste and set aside. Blanch the peas for no more than a minute or so in plenty of boiling water. Drain, add to the lentils and serve. You could wilt fresh herbs, such as basil, parsley, chives or mint into the salad. Toss them through it before serving up. Nigel Slater’s ‘Real Fast Food’ came out in 1992. To this day, this true store cupboard meal (ideal for frozen peas) is still a popular dish from that book. And not just because it is cheap and quick. As the great man himself admits, it has a surprising combination of textures. For those who prefer some meat, then try adding sausages to this easy dish for a comforting supper.